(Bloomberg Opinion) -- In an attempt to stop Bed Bath & Beyond Inc.’s long slide into irrelevance, activist investors have decided it is time to clean house. A coalition made up of Legion Partners, Macellum Advisors and Ancora Advisors announced a push on Tuesday to oust CEO Steve Temares and replace him with a “top-flight” executive who can engineer a turnaround. It also is advocating for the entire board of the home-goods retailer to be tossed and replaced by a slate of candidates that includes Jeff Kirwan, a former head of Gap, and Alexander Smith, a former CEO of competitor Pier 1 Imports Inc. The activists have the right idea in pushing for a sweeping overhaul, because management has demonstrated again and again it doesn’t have a formula for navigating today’s fast-changing retail environment. 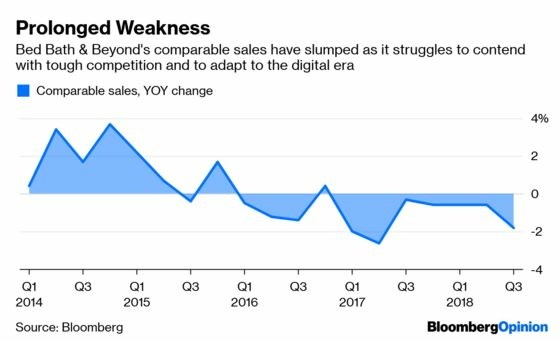 Bed Bath & Beyond’s same-store sales trends have been dismal, with growth in e-commerce offset by a dearth of traffic at its physical locations. Is that any wonder? Its stores are a jumbled mess, with loads of square footage dedicated to commodity products such as travel-size toiletries. The company purports that its mission is to be “the expert for home and heart-felt life events,” meaning it wants to be your go-to for things like wedding and baby registries. Its merchandise assortment doesn’t consistently reflect that objective. 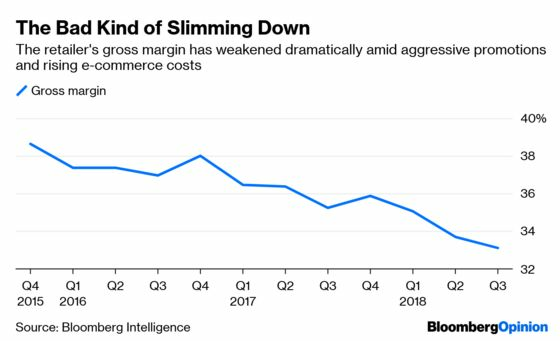 Meanwhile, Bed Bath & Beyond has seen its gross margin wither in recent years, thanks to aggressive couponing – and also to e-commerce, where shipping costs eat into profit. But the fact that it keeps going so heavy on promotions, and that those promotions aren’t even very effective in driving traffic, suggest the company has a scarcity of ideas for reviving itself. I found myself repeatedly nodding my head in affirmation as I read the activist group’s press release. They point out that Bed Bath & Beyond has been slow to build a robust private-label offering. I agree: The company is way behind on what could be a key tool for boosting its profitability and competing with the impressive work Amazon.com Inc., Walmart Inc. and Target Corp. have done in this arena. The activists also point out that Bed Bath & Beyond stores aren’t very experiential, a change that would be essential to making them more worth visiting in the digital era. Indeed, going to Bed Bath & Beyond stores can feel like getting in a time machine to 1998. The chain is experimenting with some new store displays and formats, but that process has simply moved too slowly. I wrote nearly a year ago that I thought the board ought to be considering replacing Temares. Doing so appears even more urgent now, given that the company looks so sclerotic. The activist group notes that the entire board is pretty stale, with average director tenure being approximately 19 years. It’s not hard to see how some fresh perspectives might make a difference. 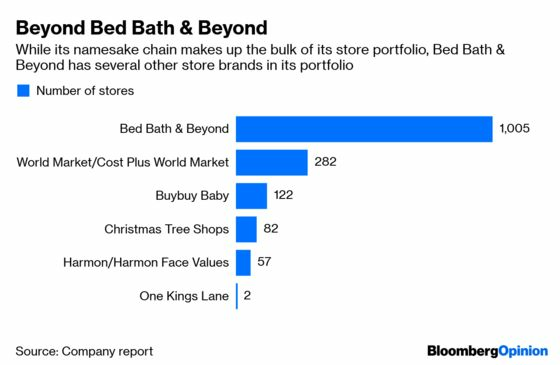 I also wonder if dumping some of Bed Bath & Beyond’s smaller chains might be worthwhile as part of a turnaround strategy. It would seem to make sense to hold on to its Buybuy Baby chain, given that it can very easily step into the void left by the liquidation of Babies R Us. But perhaps ditching chains like Christmas Tree Shops and Harmon would allow the company to focus more on its most essential task of fixing its eponymous chain. The activists are right that Bed Bath & Beyond is in a serious state of disrepair and they’ve properly diagnosed the company’s problems. Their challenge, if they succeed, will be making change happen before it’s too late.